With all the essential moving services, Meathead Movers will get you safely into your new home. Our clean-cut student-athlete Pismo Beach movers are dedicated to your 100% satisfaction. Pismo Beach, a small beach town that’s located in the southern part of San Luis Obispo County, was founded in 1846. As part of California’s Central Coast area, the city enjoys beautiful and sunny moderate temperatures year-round. 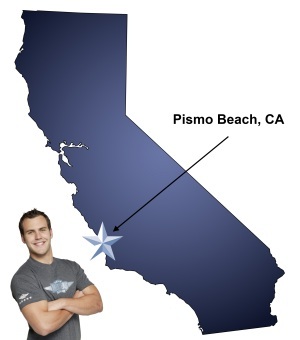 It’s no wonder so many people reach out to our Pismo Beach movers to inquire about moving here. Pismo Beach became known as the “Clam Capital of the World” in the 1950s due to the large amount of Pismo clams that could be found in the area. In fact, the clams were so numerous that they could be harvested by plowing the beach. The city is a great location for families to enjoy a day at the pier, shopping at the outlets, or enjoying a bowl of delicious clam chowder. If you are planning on moving to Pismo Beach sometime soon, check out the services of Meathead Movers. We are not like other Pismo Beach movers. We never hire temporary labor to move your items and we have a quality of work and hustle that other moving companies can’t match. All our movers are clean-cut student-athletes who don’t smoke and don’t do drugs. We put our Meatheads through an extensive screening and training process to ensure that we are providing the best movers come move day. Every single one of our Meatheads will be polite, respectful, and they will treat your items and furniture with the courtesy it deserves. Other Pismo Beach movers might be lazy and try to extend out a job, but that’s not our style. Not only do we offer fixed prices for long-distance moves, but our Meatheads will also jog to and from the moving truck when they are not carrying your items, saving you valuable. Meathead Movers can perform local moves, commercial moves and long-distance moves. We also offer reliable packing, storage, on-site relocations, and our distinctive moving concierge service, which connects you with local service providers. We are California’s go-to-guys for any moving-related job. We offer support to our clients seven days a week, and we also guarantee that the Pismo Beach movers who load your truck will be the movers who unload your truck. You won’t have to worry about needing to give a new set of movers instructions on which items are fragile. This policy makes our movers accountable for the quality of work that they do and ensures that we provide you with the best service possible. Moving to Pismo Beach can be an easy process if you choose Meathead Movers. Call us today to learn even more about our services. Our friendly staff can also give you a free, no-obligation moving quote. Unlike other Pismo Beach movers, we’ll be there for you every step of the way. Moving to Pismo Beach? Here are some helpful resources. View more Pismo Beach resources. Meathead always has the most professional employees always on time and super friendly, hard working. Always the BEST! Great customer service! Friendly, efficient, communicative staff. It was a very pleasant experience!!! Adam and Joseph were awesome!!! Moving crew was fantastic. However, I would like the company to honor my 50 dollar coupon!